OK so the boxes were partially disassembled, taped and painted (primer adhesive, color primer, color, clear coat). I think its the right color but it is a little lighter than the factory paint. I used 1 can of color for all 3 boxes. I believe that 2 cans would have given me a somewhat better, richer color more like the factory color. That said, I'm happy with the result. It is likely that I will repeat the process in the fall of this year, but for now its pretty darn close and pretty darn good. I think better looking too. Looks less like a pizza deliver bike now! FWIW, the Hepco Becker Gobi boxes come in different color schemes. All silver or a two tone Black w/Silver accents. I decided to mimic the 2 tone version of the H-B color scheme but do it in Honda's metallic red w/Silver accents. That turned out really nice. I love that red color! 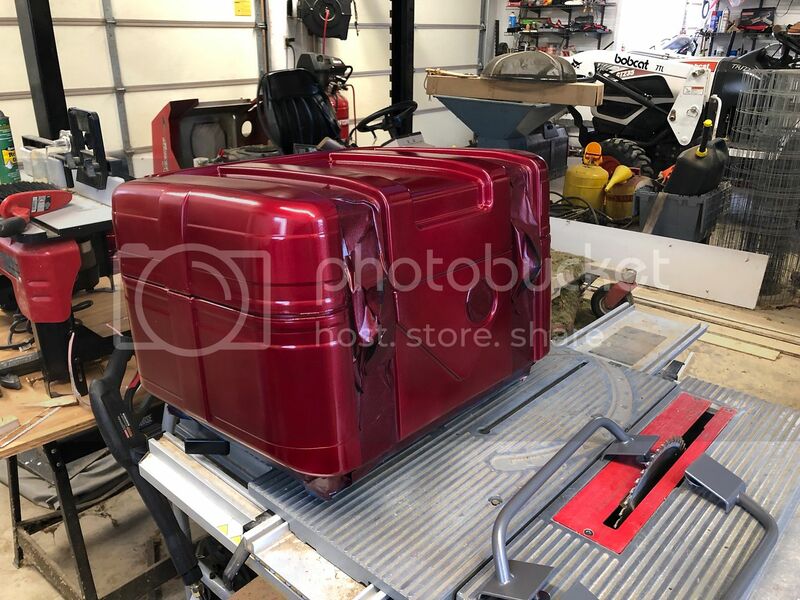 By the way, in the last photo showing the top box mounted onto the bike, you can see a lot of difference in the color between the back of the box and the color on the Frunk. Much of that difference is due to the lighting inside the garage. The color actually matches reasonably well. Better than it looks in the photo. 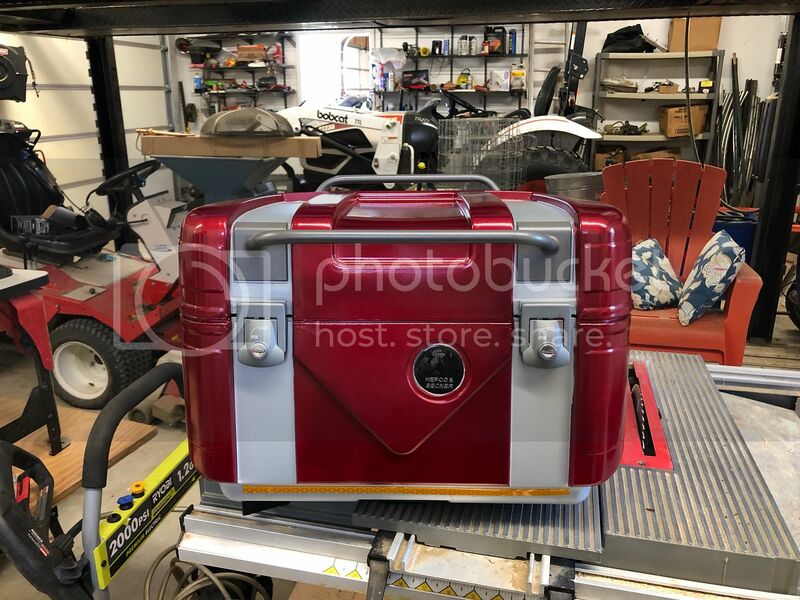 I have the garage door open and it was very sunny outside so sun was reflecting on the back of the top box and that makes it look lighter/faded compared to the side and more-faded when compared to the color of the Frunk. 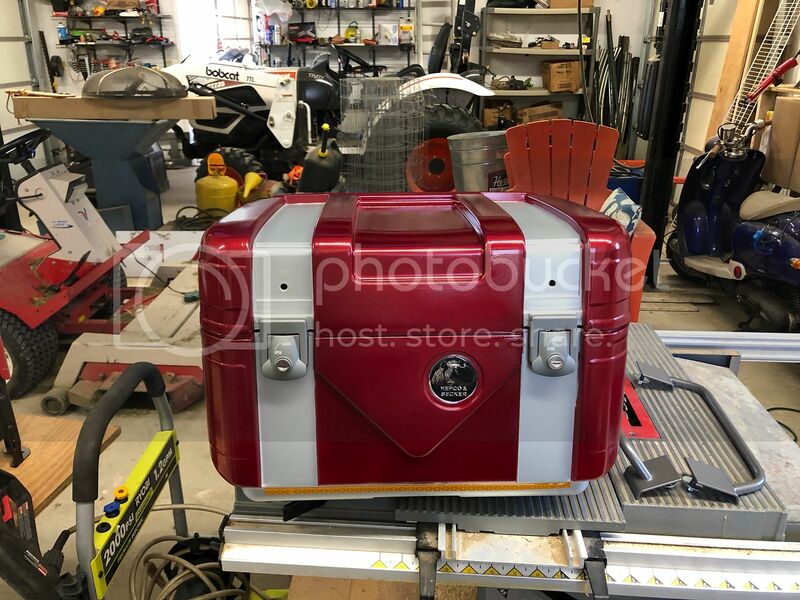 Oh, and for comparison, here is what the Hepco Becker "Black Edition" cases look like, which is what I was trying to duplicate, except in the proper Honda metallic red color scheme. I came fairly close. Some bits like the latches, are not easily removed so they had to be taped over. 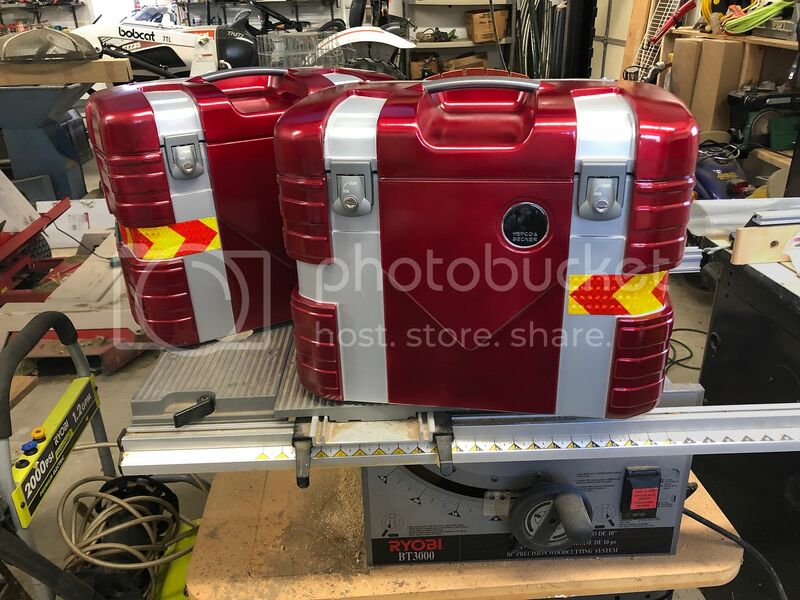 I also didn't want to paint the attachment points on the back/bottom sides of the boxes because I figured it would not hold up and would simply chip/wear. Overall I really like these boxes. Somewhat bulkier than an aluminum box but they can take a beating. H-B Gobi boxes are the factory boxes used on some of the KTM bikes. I bought them because I got a smoking hot deal and couldn't pass up the bargain. I also like the fact that the side pannier racks are attached by quick attach assemblies. Remove the cases and a simple half-turn on the various attachment points and the whole rack assembly removes. About a 1 minute job to remove and 2 minutes to reattach. Last edited by melensdad; 10th April 2019 at 06:59. OK so here is the whole bike, with side and top boxes. 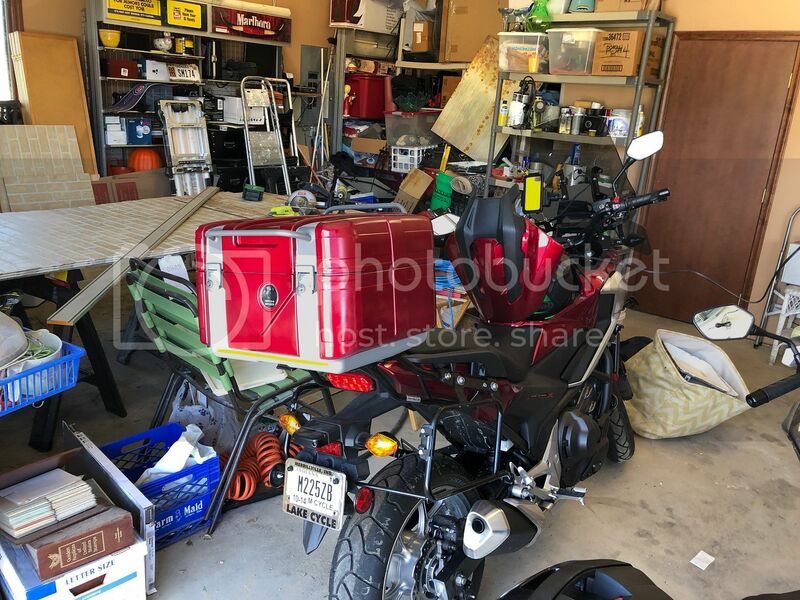 Pardon all the construction debris around the bike, we are remodeling the upstairs apartment over the garage and everything but the bikes are moved outside so we can work inside. 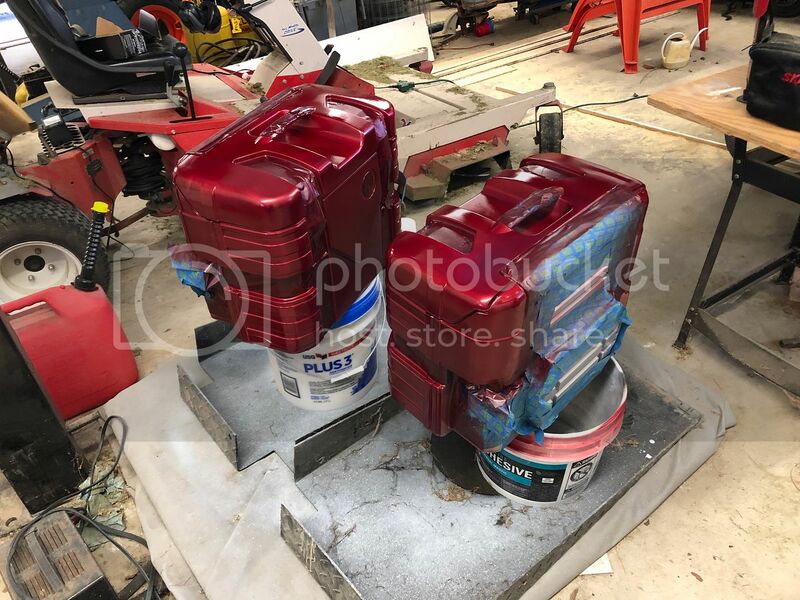 I'm glad that I mimicked the Hepco-Becker 2 tone scheme instead of their monochrome scheme; I like the two-tone red-silver boxes and think they very nicely match the two-tone red-silver Honda paint scheme. I also like the fact that the boxes don't stand out visually like big square silver pizza delivery boxes anymore. 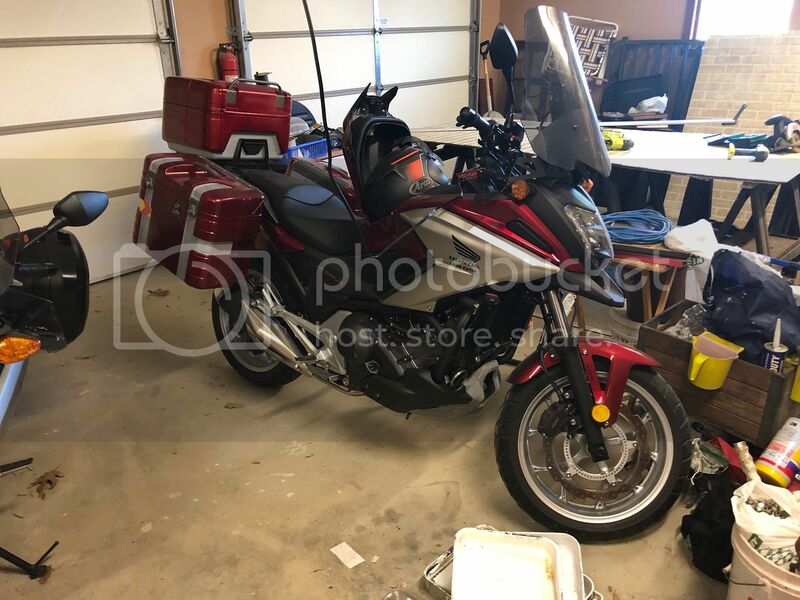 I think the red paint makes them look visually smaller and integrates them visually better with the bike and the silver accents match the Honda silver accents nicely. Of course, just my opinions but I'm the one who has to live with it. For me, its a major improvement in looks. Looks great: You should continue... and have your helmet painted the same.